Our cozy, economical Pool Front Rooms are located at the back of the Main Building - on the deck and just a few steps away from our tropical pool. Each room sleeps up to 4 people, with one double bed and one double-size fold-out sleep sofa. 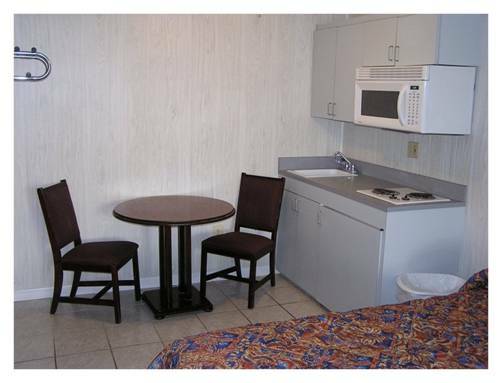 The room also has a small refrigerator, microwave, and cable TV. Bathroom with shower. Air-conditioning. Our convenient Efficiency Rooms are downstairs on the front side of the Main Building, conveniently located by the parking lot. These rooms can accomodate up to 6 guests, with two double beds and one double-size fold-out sleep sofa. The kitchenette at the back of each room has an under-the-counter refrigerator, microwave, 2-burner stovetop, small sink, cupboards & countertop, and a small table with chairs. Cable TV and air-conditioning. Full bathroom. Our spacious Family Rooms are upstairs in the West Building. Relax on the shared front balcony and enjoy the convenience of the back-door entrance from the parking area, located behind the building. Family Rooms comfortably accommodate up to 6 people, with two double beds and one queen-size sleep sofa. 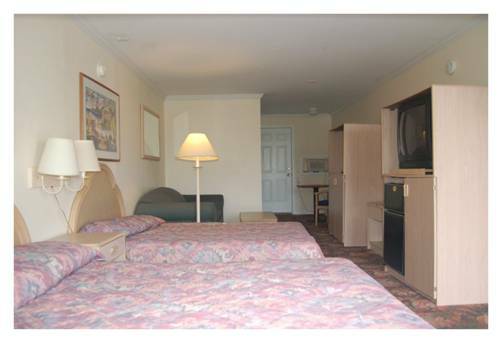 The room has a microwave, small refrigerator, and cable TV. 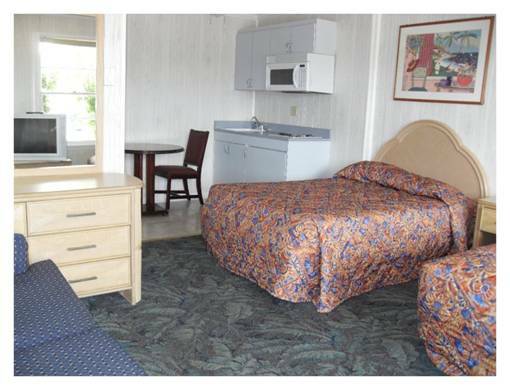 air conditioners, and full bathroom. Located on the ground floor of the West Building, this large suite sleeps up to 12 people. 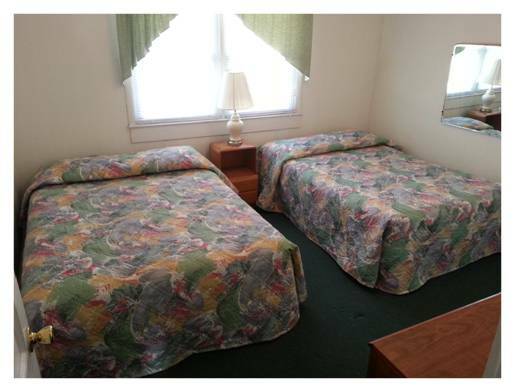 Bedroom #1 has one double bed, Bedroom #2 has two twin beds, and, Bedroom #3 has two double beds. 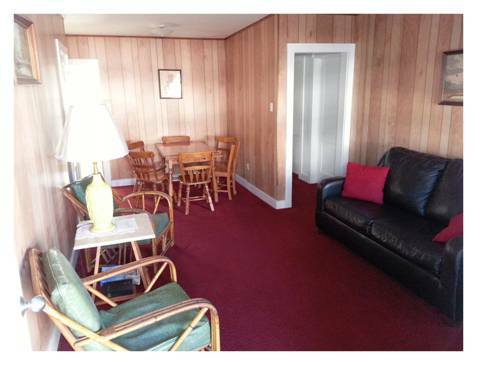 The living room has two queen-size sleep sofas, cable TV, small dining table & chairs, and an air conditioner. The kitchenette has a full-size refrigerator, microwave, 2-burner stovetop, stainless steel sink, lots of cupboards and countertop space. One full bathroom. Also located on the ground floor of the West Building, this 2-bedroom suite can accomodate up to 12 guests. Each bedroom has two double beds and air-conditioning. 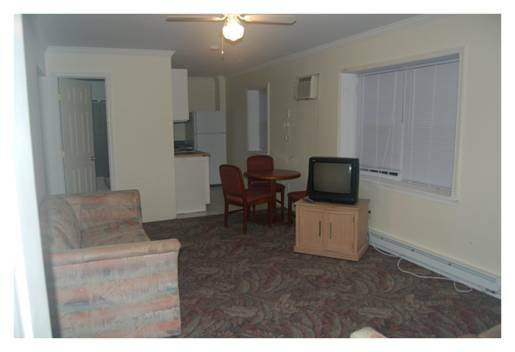 The living room has two queen-size sleep sofas, cable TV, small dining table and chairs, and an air conditioner. The kitchennette has a full-size refrigerator, microwave, 2-burner stovetop, stainless steel sink, lots of cupboards and countertop space. One full bathroom. This comfortable ground-floor unit on the front side of our North Buildign has a large, private porch - perfect for people watching while you relax with friends. Just around the side of the building and a few steps across our private deck area is the tropical pool. This room comfortably sleeps up to 11 guests. 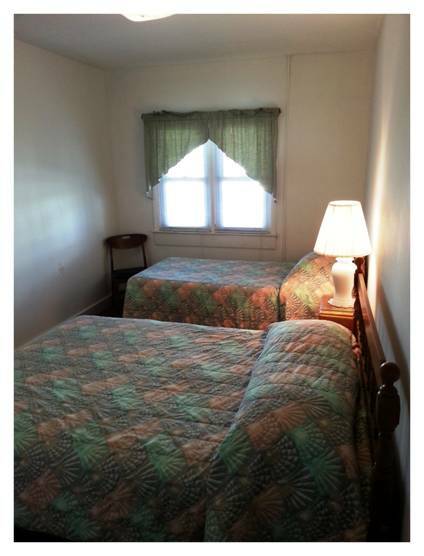 The front bedroom has one double bed and one single bed, and the back bedroom has two double beds. 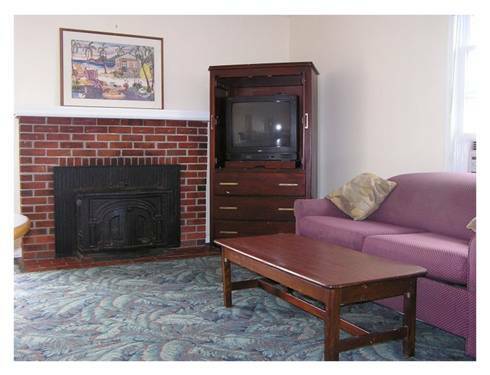 The living room has two fold-out sleep sofas, electric fireplace, and cable TV. 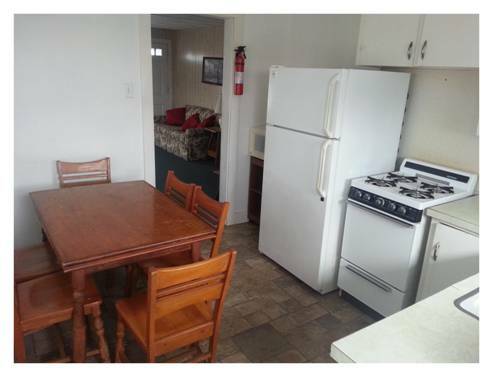 The full kitchen includes a full-size refrigerator, stove/oven, microwave, stainless steel sink, and cupboards. Full bathroom. Air-conditioning. This ground floor unit at the back of the North Building feels cozy and secluded - with its private patio, gated entrance from 13th street (a very short 1-block stroll to the beach and Boardwalk), and patio entrance to the pool. This suite sleeps up to 8 people. The bedroom has two double beds and there is a closet in the hallway just outside of the bedroom door. The living room has two double-size sleep sofas, cable TV, and dining table with chairs. 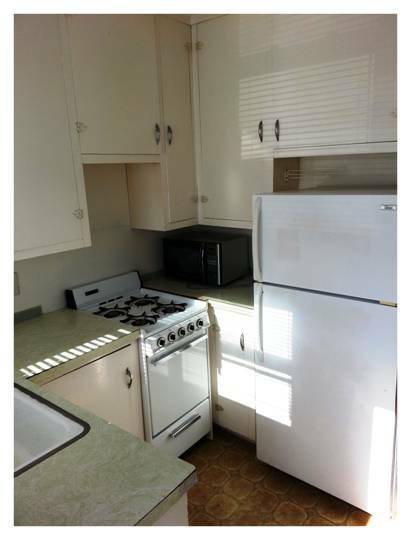 The kitchenette has an under-the-counter refrigerator, microwave, 2-burner stovetop, small sink, cupboards, and countertop. Bathroom with shower. Air-conditioning. This upstairs suite at the back of the North Building is one of our most popular units! Everyone loves the large, private balcony overlooking the pool. Spend relaxing evenings lounging with friends. Go to and from your room from the inside stairway or use the back stairs to go directly from the pool to the balcony to the Pergo-floor living room. This unit accommodates up to 9 people. Bedroom #1 has one double bed and one single bed and Bedroom #2 has one double bed. The living room has two sleep sofas. 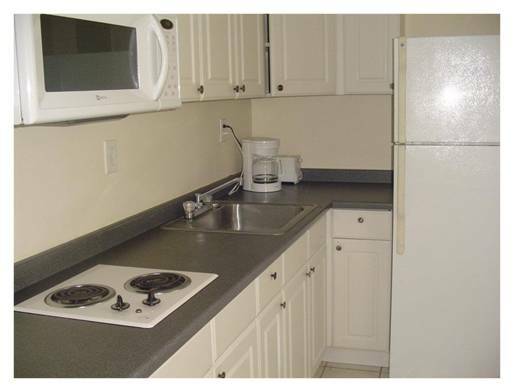 The kitchenette has an under-the-counter refrigerator, microwave, 2-burner stovetop, small sink, cupboards, and countertop. Bathroom with shower. Cable TV and air-conditioning. This 2-story unit on the 2nd and 3rd floors of our North Building is our second-largest! It will sleep up to 17 people - making it perfect for your large group of friends. The inside entry door is on the 2nd floor of the building and pool front access is from the 3rd floor bedroom. DOWNSTAIRS (2nd floor of building) - Large, private front balcony. 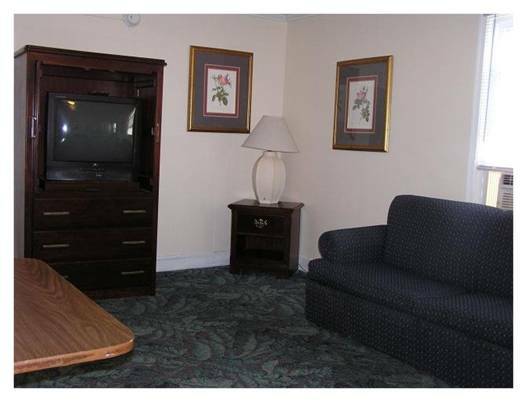 The living room has 2 queen-size sleep sofas, table & chairs, cable TV, and window air conditioner. The full kitchen has a stove/oven, microwave, full-size refrigerator, stainless steel sink, coffeemaker, toaster, cupboards and countertop. Bedroom #1 has one queen-size bed. Full bathroom. UPSTAIRS (3rd floor of building) - Bedroom #2 has 5 single beds and Bedroom #3 has 3 double beds. Bathroom with shower. Air-conditioning. Back exit from Bedroom #2 to pool area. 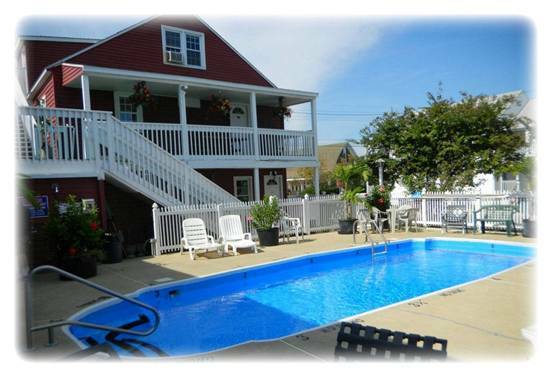 Our 2-Bedroom Homestead Apartments are still only 1.5 blocks from the middle of the famous Boardwalk and Beach. 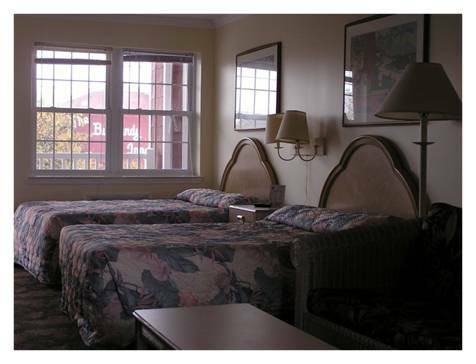 Located at 14th Street and Philadelphia Avenue, these apartments have the perfect location and provide the ideal spot to book your stay for Senior Week. 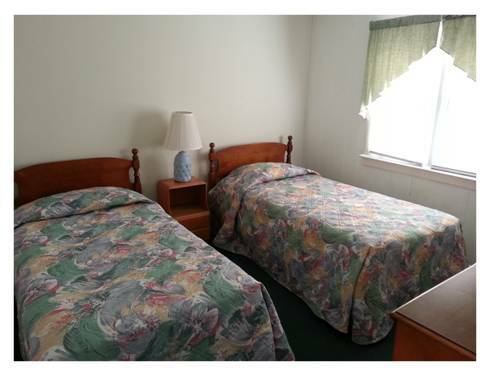 Each bedroom has 1 twin bed and 1 double bed. There is a double-sized sleep sofa in the living room. 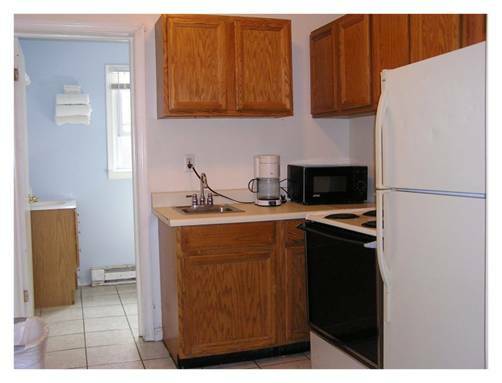 Kitchens are equipped with a full-size refrigerator, stove/oven, microwave, and sink. Roomy front porch provides a great hang-out for friends and people-watching. Window air conditioners are in bedrooms only. Fan or ceiling fan in living room. Cable TV. Parking for 1 vehicle in lot. 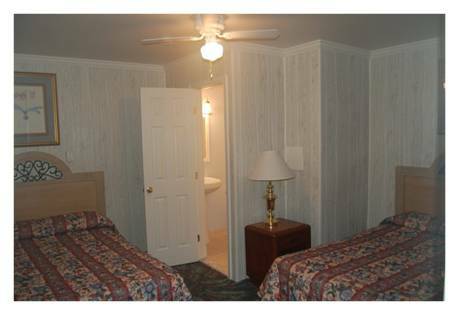 Our large 2-Bedroom Stonehaven Apartments are similar to the 2-Bedroom Apartments that sleep 8. The 10-person apartments provide a little extra room with a second sleep sofa in the living room. Great for the groups that need a little more space for their vacation! 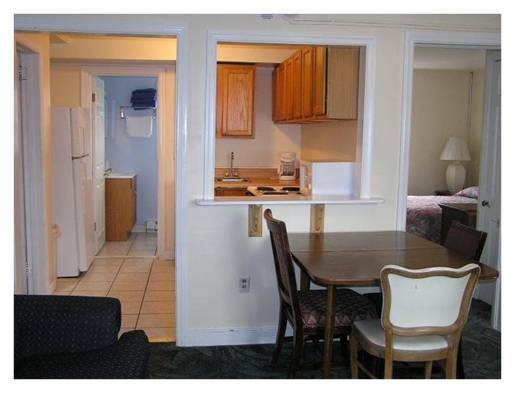 The 4-Bedroom Apartment is THE SPOT for large Senior Week groups. Fit all of your friends in this 2-floor apartment because it can sleep up to 18 people! With 2.5 baths you dont have to wait to get ready. After a relaxing day at the beach or adventurous night on the boardwalk, hang out on your large 2nd floor porch with your friends! **All amenities (tropical pool, ice etc.) at the 12th Street Hotel are available for guests staying at the Stonehaven and Homestead Apartments. One Parking Space guaranteed per unit, regardless of unit size.